Donruss Trading Cards announced the beginning of a 10-year partnership with one of baseball�s living legends. Willie Mays and Donruss have signed a 10-year, exclusive contract for autograph and memorabilia cards of the "Say Hey" Kid. "It�s hard to describe the experience of sitting in Willie Mays� kitchen, several times over the last year, talking baseball and the hobby and just getting to know each other," said Donruss/Playoff president Bill Dully. "In the end, we both new that a partnership between us was a great way to carry on Willie�s baseball heritage." This is not the first time that Mays and Donruss have worked together. Mays had an autograph agreement with Donruss in 2001 which included the only certified autograph card with both Mays and Barry Bonds � the 2001 Donruss Elite Passing the Torch #PT18. Grant Sandground of Beckett Baseball says "This is hands down one of the greatest cards produced in the modern era ..."
"We�re looking forward to getting Willie involved in our products right away." said Donruss director of product development Rob Springs. "His autograph and game-used memorabilia cards will appear in most 2005 products, starting with Donruss Classics, releasing March 16." 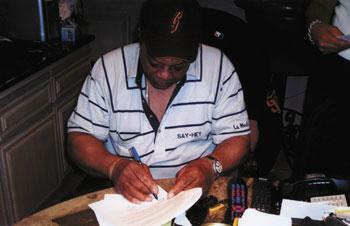 The majority of Mays� autographs will be the traditional signature that is so recognizable in the hobby. However, Mays will also be involved in choosing certain cards or sets where he will add notations to his autograph that recognize significant and/or record-setting events from his career. But autographs and memorabilia are just the beginning for Mays and Donruss. Mays will work with the Donruss product development team in many areas including set makeup, player selection and his own appearances in products. The partnership also allows Donruss to use Mays� likeness on packaging, which the company will do, with his first appearance on 2005 Donruss World Series, scheduled for release October 10.